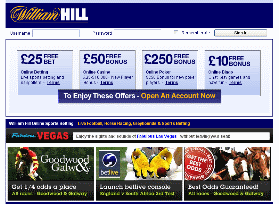 William Hill £25 | Compare odds UK, Europe, Premier League and European leagues. Another titan of bookmaking. William Hill are now offering a free £25 bet for all new online customers. Whatever your sport, it is likely that we will offer odds on it. All major worldwide sports are covered, including NFL, College Football, Baseball, Basketball, Boxing, Golf, Cricket, Horse Racing, Ice Hockey, Motor Racing, Soccer (English and European Leagues), Rugby League, Rugby Union and many more.